Today is day five of snow(ice)apocalypse in the Atlanta area, but heh, who’s counting? We’ve only been stuck in our houses since Sunday and today is Thursday. No problem! I’m getting used to it. I tried to leave the house today only to be met by six inches of ice, so forget about that. I went back in and chatted with friends and fellow food bloggers on the phone all day! Well, I don’t know what you have been up to over the past week (so I hope you will share with me in the comment section! ), however, I can tell you that I have been purging cleaning out drawers and closets. (That was before all the chatting on the phone stuff!) It is an invigorating experience to get rid of garbage things you have been holding onto hoarding for years! I decided after yesterday afternoon that I better get back in the kitchen and out of the closet (not literally) because this little storm has become very expensive! I now am in the market for new cosmetics, pj’s and socks since I have thrown all of mine away! Since I was heading back into the kitchen for a change of scenery, I wanted to make this garlic soup or Cote d’ Azur Cure-All Soup (from Dorie Greenspan’s Around My French Table) with some of the organic garlic that I won from the giveaway at Love and Olive Oil and Singer Farm Naturals. Besides being able to use lots of my garlic in the recipe, the title said it “cured all”, so I am figuring it takes care of my boredom, too….? Lots of garlic for me to play with! I have thoroughly been enjoying my garlic! I have baked it, preserved some, cooked with it (in pasta, stews, sauces) and have actually eaten it almost raw (with just a quick warming up in the pan). I had to try the different varieties! Mr. Bunkycooks hasn’t run away from me yet, but I suppose we’ll have to see what happens after eating this soup! I decided to call Singer Farm Naturals to ask about proper long-term storage for their garlic since I had quite a bit of it. Tom, the owner, also told me some interesting facts about garlic. Garlic is known for many health benefits (when properly used), such as treating the common cold, hypertension, infection and even certain cancers. The cloves contain an enzyme (allinase) that once disturbed by chopping or mincing, releases another chemical version of that enzyme called allicin. This soup is so easy to make! In order to get the most health benefits from allicin, you need to use the garlic as quickly as possible (within three hours of chopping it) and not heat the garlic at high temperatures or cook for too long. Allicin is the enzyme that offers such great health benefits. Of course, Basil Pesto and Pasta was supposed to be on the menu for dinner this evening (a great healthy use of garlic), but the store didn’t have fresh basil. In fact, they didn’t have much of anything in the produce department here in Atlanta! Looking for dairy products? You won’t find them in Atlanta this week! Basil or veggies…forget about it! Well, I have lots more garlic (thanks to the giveaway) and will continue to enjoy it and make that pesto once our stores are stocked with food again! We have learned one thing for sure after this snowpocalypse, one can never have too much food or good wine stashed in their home! Of course, we knew this to be true, but now we really know why!! Now for the giveaway, Tom at Singer Natural Farms has offered to do it one more time and send out a goodie package of some of their organic garlic to one of my readers. I know that some of you were disappointed that you didn’t win before, so here’s your chance to try to win again! This is a quick giveaway, so hurry up and enter below! A winner will be chosen this Sunday, January 16th. Leave a comment on this post telling me what you would like to make with some of this organic garlic! Here are a few more ways that you can enter. 2. Become a fan of Bunkycooks on Facebook. Leave a comment here indicating you are now a fan. If you are already a fan, you can leave a comment saying you are. *** Please be sure to leave separate comments as they are easier to count! Thank you! This giveaway ends at 5 pm EST on Sunday, January 16th. I will notify the winner by email. Please get back to me with your shipping information within 48 hours. Regretfully, this can only be shipped to a winner in the U.S.
Notes on the soup: The soup was wonderful! I was so surprised at the flavors from just a few simple ingredients and such an easy recipe. It just goes to show you, that delicious and beautiful food does not need to be complicated! I did use half Swanson’s low-sodium chicken broth and half water (as suggested in the recipe), a good Parmigiano-Reggiano cheese and I chose to make the soup with Singer Farm Natural’s Nootka Rose Garlic. I did not post the recipe out of courtesy to the author, Dorie Greenspan, and the fact that the cookbook is so new (Around My French Table). I suggest you buy a copy so that you can try some of these wonderful recipes yourself. 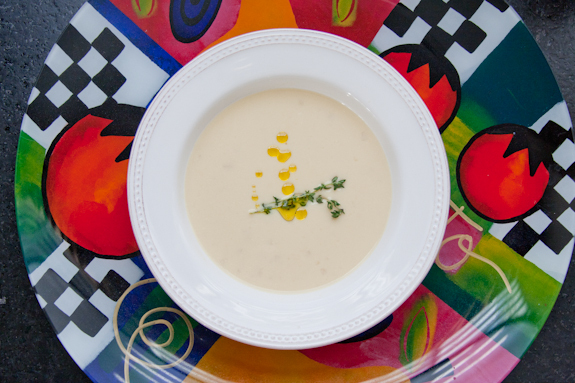 This soup is beautiful and truly delicious! I would roast some to make roasted garlic hummus, roast some more for garlic bread and use it in my favorite dishes that call for garlic like braised beef short ribs. Thanks for the giveaway and thanks for all of your advice and help! This soup sounds absolutely wonderful! I treated myself to Dorie’s book, so I’ll just have to look it up. I need a basket of garlic because, in addition to Dorie’s soup, I have a hankering for a big pot of panade – stale bread and greens soaked with a garlicky chicken broth. BTW, love the charger that the soup plate is on – it really makes the picture pop! With the garlic, I’d whip up meatballs in a tomato garlic sauce along with your garlic soup (it sounds fabulous). I love, love, love your pictures!!! Debra – maybe I can send you some next summer? There’s definitely a point every year where garlic must go. Sofya – i may just take you up on that one!! I just a magazine article on the benefits of eating garlic! It helps boost the immune system. I would love to win. I like to use minced garlic in stir fries, soups, and vegetable casseroles. I have never tried organic garlic before – I sure would like to knowing its natural and free of pesticides and nasty chemicals. Fingers crossed! I’m already following @bunkycooks on twitter! I’m already a fan of Bunkycooks on facebook. P.S. I was beginning to think everyone in Atlanta are weather wimps, but your post made me realize that it’s been really bad there! No one can deal with 6 inches of ice! Hope you thaw out soon! I can’t believe those pics of the grocery! Wow. Makes me glad I live in Phoenix, my kids couldn’t go without milk! For starters, I would def make this garlic soup! We l.o.v.e garlic around here! Also, home made marinara and chilled gazpacho we drink several times a week w lots of garlic for health reasons. 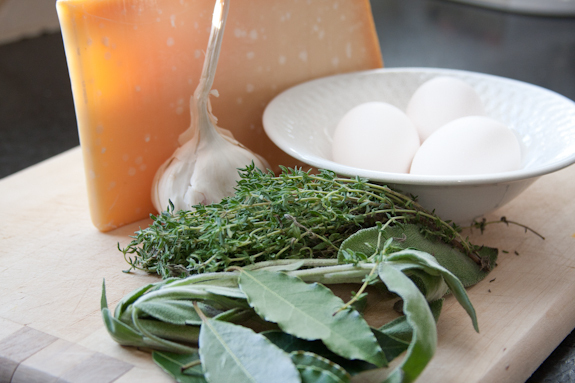 I think I will make a chicken dish with lots of garlic, lemon & rosemary! Love the soup recipe, it looks really easy! OK I got to taste this wonderful soup……Its great! You have to make this for your next dinner party! Mr Peterson and I would use 40 cloves of this wonderful garlic just to make my mother’s fabulous garlic chicken because we miss her terribly back in South Africa. She grows her own organic garlic too and we haven’t been able to find anything like it yet. Of course, afterwards, if there were any garlic left, we would definitely attempt this garlic soup. Boy, for garlic lovers such as ourselves, it sounds like a trip to heaven! Remove neck and giblets. Rinse and pat dry. Rub skin with olive oil. Place in the cavity 1 lemon quartered. Put chicken breast side up in casserole, cover. Refrigerate 2 – 24 hours. Preheat oven to 190C/380F. Add to the casserole with chicken. 3 heads garlic – cloves separated – not peeled. Bring to the boil, cover the casserole and roast for 25 min. Increase oven temp to 230C/460F uncover casserole and roast chicken until juices run clear. Check to make sure there is always liquid in casserole. Add wine or stock if needed. Remove chicken and garlic from casserole and keep warm. Skim fat off juices. 1 tablespoon parsley, basil or mixed herbs. Unpeeled garlic cloves must be squeezed out of their jackets by the diners! 40 days and 40 nights without garlic would be the end of the Peterson family. absolutely follow you on Twitter! I definitely a fan on FB! How crazy that you’ve had as much snow as you have… but I’m glad you are surviving down there. 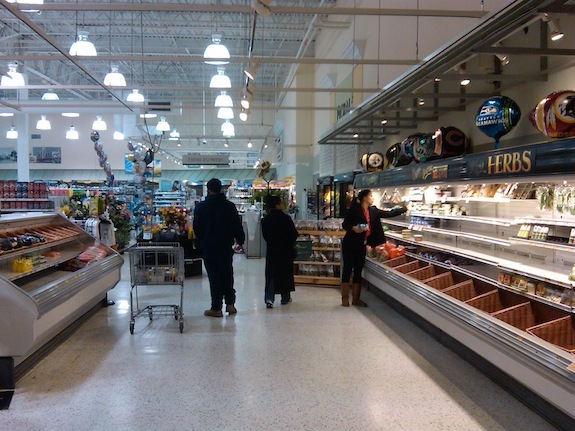 The pictures of the grocery store!!! What a mess! Glad you were able to find such a flavorful and simple dish to make from Dorie’s book! Can’t wait to try it myself! I use garlic on almost everything I cook. I love to roast garlic with a beef roast and of course I would make pesto! Awesome giveaway & I follow you on twitter. anchovy. A wonderful treat for spreading on house-baked focaccia. If you ever visit San Francisco, you should stop in. Oh, Bunky, what WOULDN’T I make with all that garlic? 40 clove chicken, margherita pizza, herb-crusted pork loin, the list goes on. I go through piles of garlic every week. In fact, I rarely do giveaways so the fact that I’m really going to try for this shows how much I love garlic. Wow, what a giveaway. I already have been following you on Twitter so here’s that comment. Now that that’s out of the way, I will use this spot to say that the soup looks divine. You did an incredible job with making it so silk and smooth (beautiful photography too). I didn’t know you were on Facebook, but I’m following you there now too. Atlanta stores are definitely hurting. Wow. I’m sorry. We had a quarter inch of snow here in Winston Salem and the schools have been closed for 4 days. They didn’t plow, just have been waiting for the sun to melt it all. In this area, I miss the organized, snow-wise ways of the North. I can’t imagine the kitchen being without garlic. There are so many recipes to make with this wondrous vegetable. I would caramelize a bulb in the oven and serve it with baked brie and fresh crusty bread. I’m now following you on Twitter. Discovered you by a Chobani yogurt retweet! I’d use the garlic in various soups (my favorite is butternut squash soup) or maybe some guac. Yum! I would make any big dish of roasted garlic to use in everything (bread, pasta, Brie, etc) and also make some marinara sauce! Garlic-Feta subs!In 400 degree oven put small sub rolls,split,brushed with olive oil and topped with many cloves of minced garlic.Top that with crumbled feta cheese and toast until fragrant.Remove from oven and top with slices of hard boiled eggs,green onion,sliced black olives and sliced tomatoes.Drizzle with balsamic vinegar and put halves together.Sounds weird,but trust me,its delicious! I would love to make LOTS of roasted garlic. And some shrimp and pasta arrabiatta. We love garlic. I would make garlic mashed potatoes and lasagna with lots of garlic and garlic studded beef roast. I could go on and on. i am following you on the twitter now. i like you on the facebook as well! I am Canadian, so count me out on the giveaway but ohhhhh I am loving the sound of garlic soup. Too bad I can’t make it in my house though…too much garlic gives my honey the night sweats and bad dreams. Weird right? It has totally quashed my absolute love of all things garlic and I squirrel it into as many dishes when he is not home as possible. But if I had that much garlic, he might just have to sweat it out me thinks! I am already a stalker in all ways, shapes and forms…and I also happen to have a ton of garlic so don’t count me in this contest…just wanted to say how fabulous that soup looks and what a BEAUTIFUL picture! What would I make? What WOULDN’T I make!? We use three heads of garlic a month. Yes, THREE HEADS (48-50 cloves/head). To be sure, though, I would start by making your soup! Bread, pasta sauce, aioli (is that the way you spell that) it tastes good anyway. 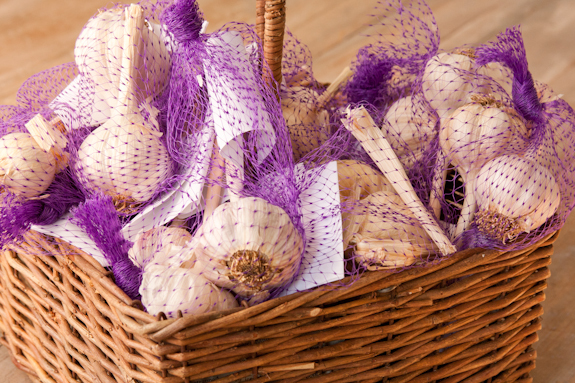 Have you ever been to the Gilroy Garlic festival? They even have garlic ice cream….that I have never tried. When you drive through Gilroy you can smell the garlic even when the festival is not going on. I was going to say I could use the garlic in garlic bread, or perhaps in rice and beans, but then I saw the great recipes in the comments and probably need to go write those down…can never have too much quality garlic! We can never have enough garlic – about the only thing I don’t use garlic in is dessert, though I would like to try the garlic ice cream Tricia mentioned. If I won this garlic, the first thing I would make is spaghetti sauce and garlic bread. I am going to start with Pesto and Shrimp Scampi. Hi there! garlic soup sounds wonderful. I would like to make more of my chicken confit (I posted a recipe just recently)…my last version needed a LOT more garlic!!! oh and I have been following you on Twitter. I would love to make a garlic soup like the one you shared with us today. Dorie never lets me down, and I’m sure this soup is just scrumptious. Additionally, I am in need of something warm and packed with nutrients! 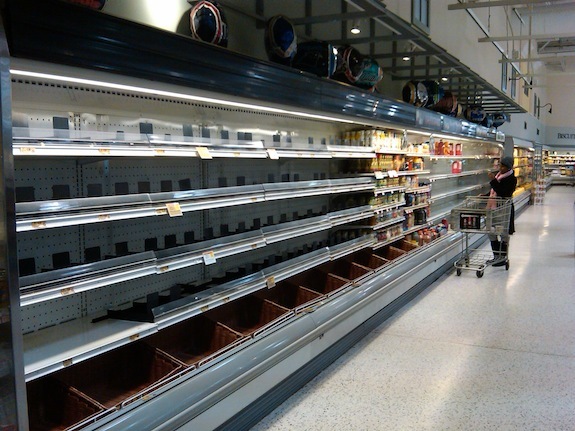 I can’t believe how the grocery stores were cleared out in Atlanta! Wow! I guess people have a tendency to panic…but goodness, it is just snow! Thank you so much for sharing with me, week after week. May your Sunday burst forth with joy and love. I would make a fabulous spaghetti sauce partnered with a lovely garlic bread. Thank you for your ideas! 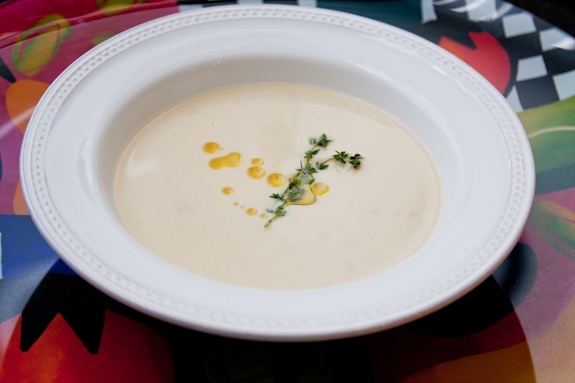 Smooth, savory, garlic-y bread and garlic soup from Portugal. With an egg. Love it. Good luck with all that Ice. I know how bad it can be. We were once trapped on a farm in very rural Indiana with no power and a year old child, and our only heat coming from a very efficient (thank God) fireplace — for 7 days. It was pretty bad. On a farm, no power equals no bathroom facilities because no running water. Do you still have water? If you do, I know it’s small consolation, but it’s better than nothing? We didn’t even have phone service. I would love to make some shrimp scampi with this organic garlic! I use garlic in just about everything but, I have never eaten it raw. If I won, it might be the first thing I do with the garlic. Thanks! Fantastically informative post Gwen – visiting your blog is always so educational! I love the idea of a soup where garlic is the star of the show, though I haven’t done one yet. That is a beautiful! “Snowpocalypse” – that sounds scary and funny too!